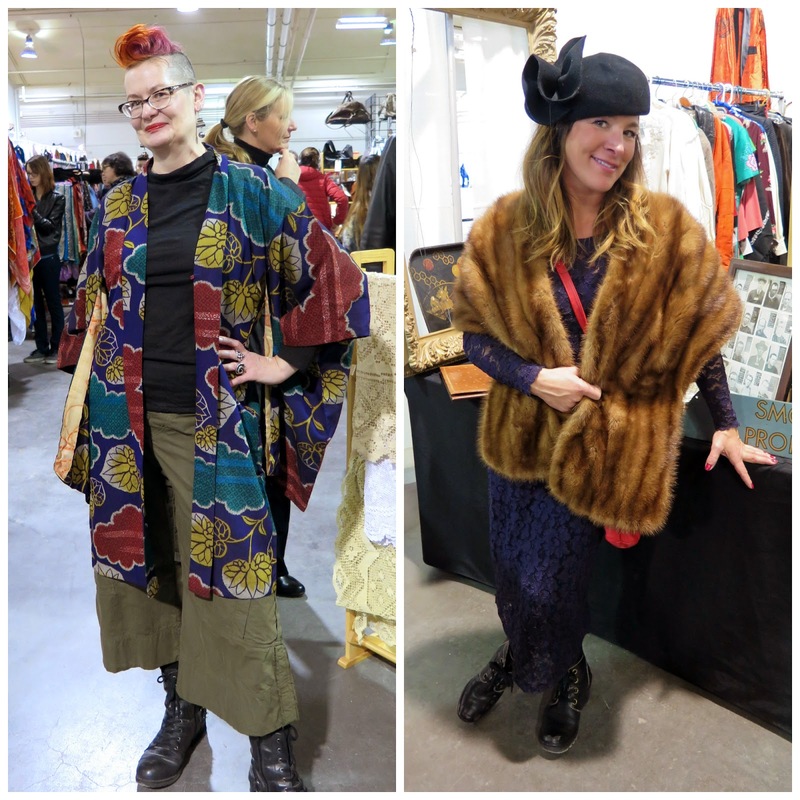 Last weekend my friend Sylvie and I went to the Toronto Vintage Clothing Show. I had heard about the show from previous years, but neither of us had ever attended, and the weather was perfect for a road trip. 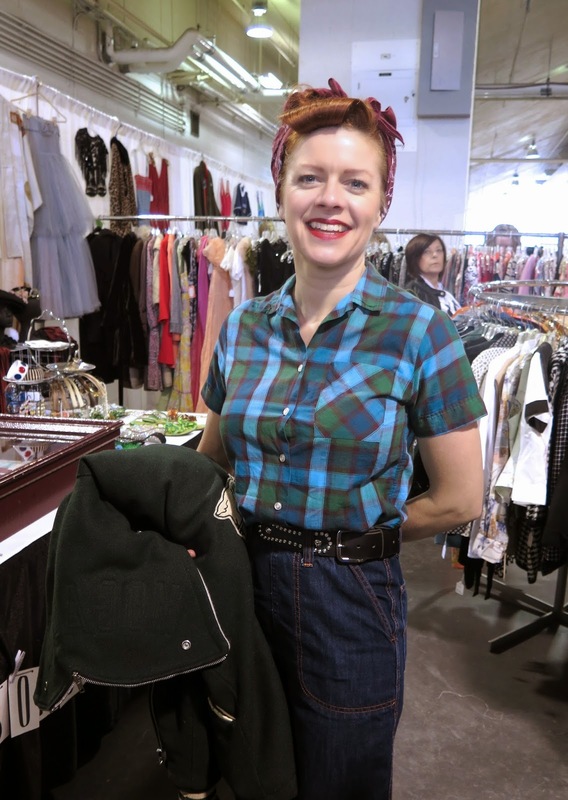 The show is the largest sale of vintage clothing in Toronto, and features vendors from across Ontario. 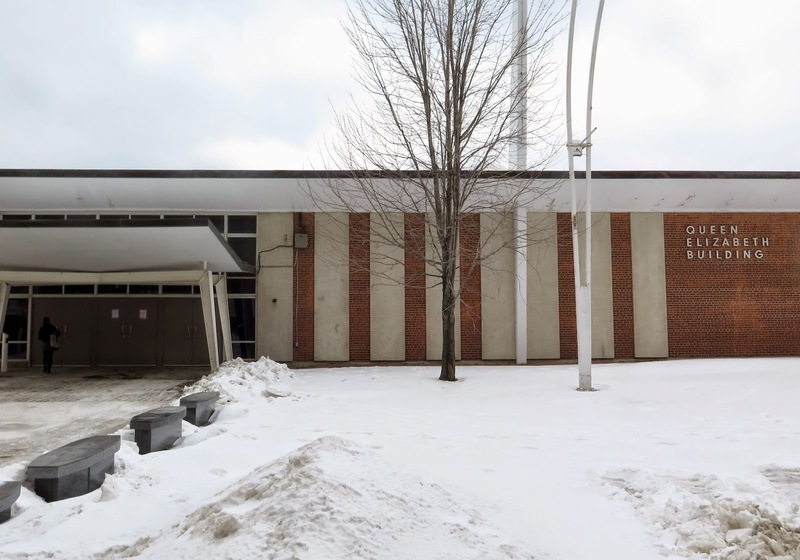 The location of the show changed this year from the Toronto Convention Centre to the Queen Elizabeth Building at Exhibition Place with more space. 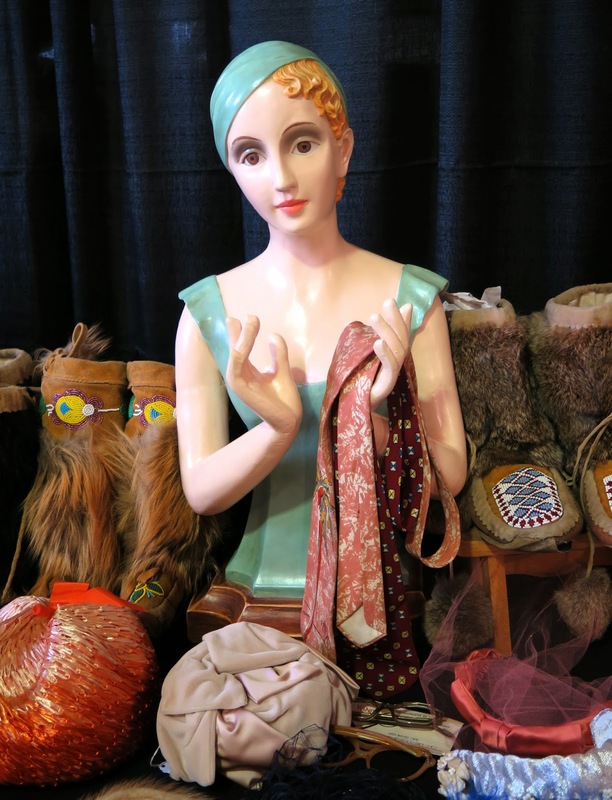 The show was combined with the Toronto Antique and Vintage Market so if you weren't interested in the clothing, there was also furniture and other home decor items, art, glass, and other collectibles. The venue didn't look too promising from the outside. 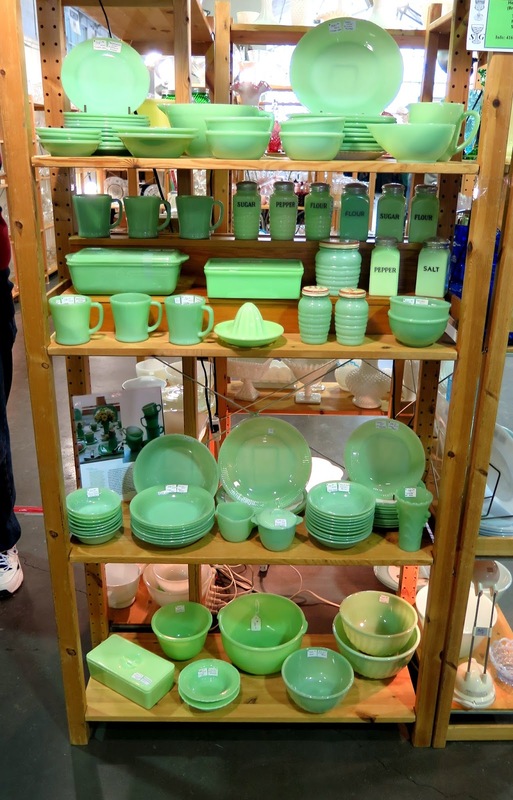 Fortunately, once we made it inside past the admissions table we were greeted by the sight of all this lovely spring green dishware at the Sean George Pressed Glass and Goblets booth. Anyone know what this particular type of glassware is called? And what did we wear, you ask? The only vintage piece I'm wearing is the 1920's haori I purchased at the Manhattan Vintage Clothing Show last October. Sylvie went all out, in a vintage lace dress and fur stole. There was a good selection of hats available, many of them adorned with flowers and feathers. 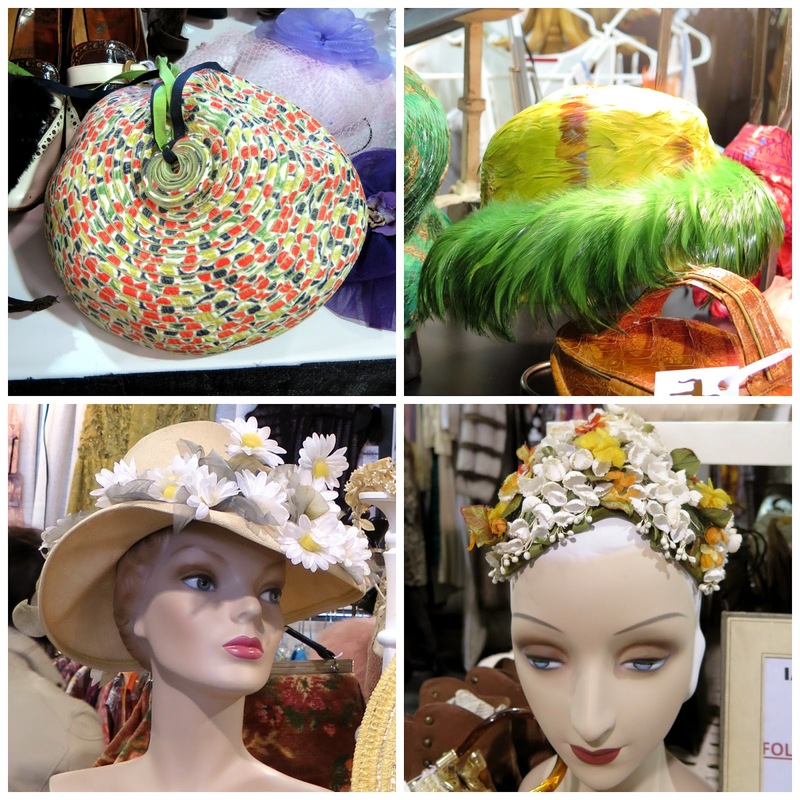 Clockwise from top left: stitched fabric beret-style hat from Beyond Friperie; fabulous feathers from Primetime; and two flower-covered hats from the Ian Drummond Collection. The first booth that I spent time in was KDS Art Wear Home. 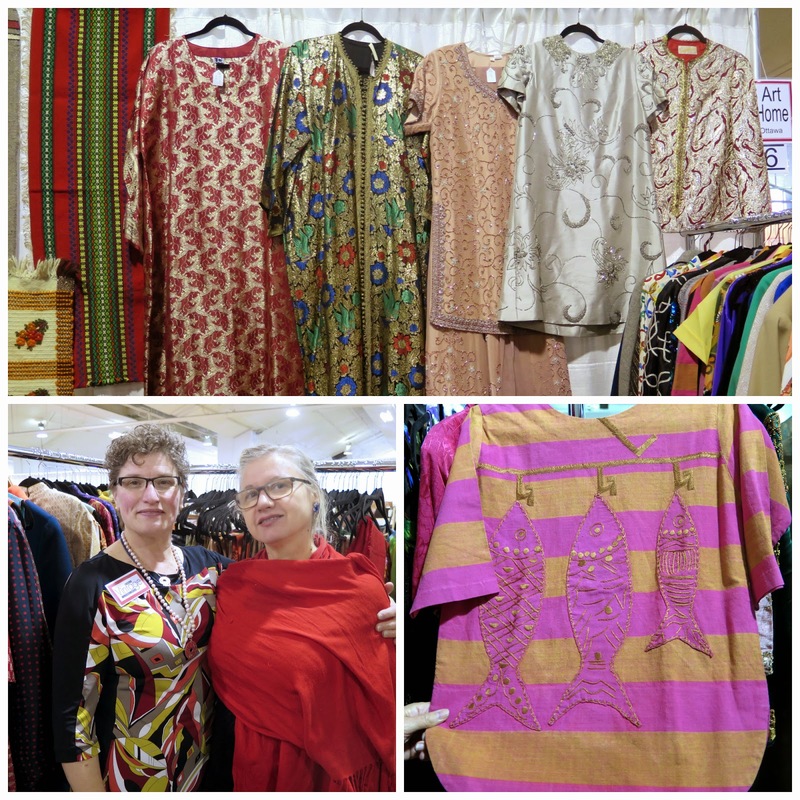 Owner Karen Samanski (on the left side in the bottom left photo) and her sister (in the red shawl) were manning the booth, and I was drawn to a long dress/vest that Samanski's sister was holding. After trying it on and deciding it was coming home with me, I stayed to chat and browse their collection of beautiful textiles and garments from all over the world. The fish applique top was another favourite of mine, but alas, too small. How cool is this brown-eyed beauty at the Beyond Friperie booth? These were two of the older pieces of clothing that I noticed, and I thought both of them could easily be worn today (if the fabrics weren't so fragile). 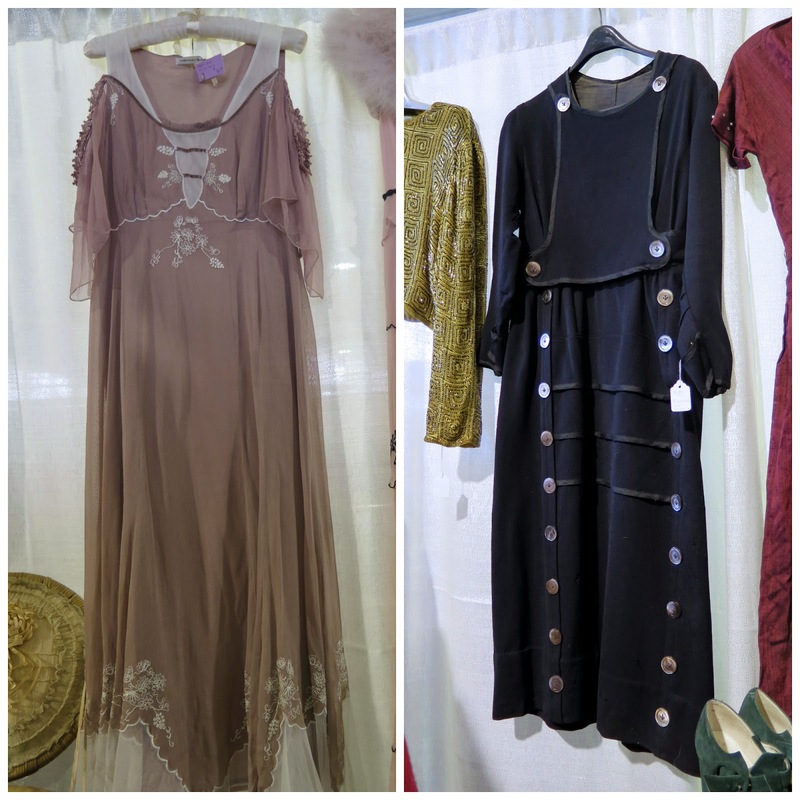 The 1930's tea gown from Petticoat Lane Antiques on the left would be perfect for a garden party, worn with a wide brimmed hat, and the Edwardian black dress with multiple buttons from Winsome Vintage could just as easily have been been worn in the 80's or present day. Each was priced at just under $100. 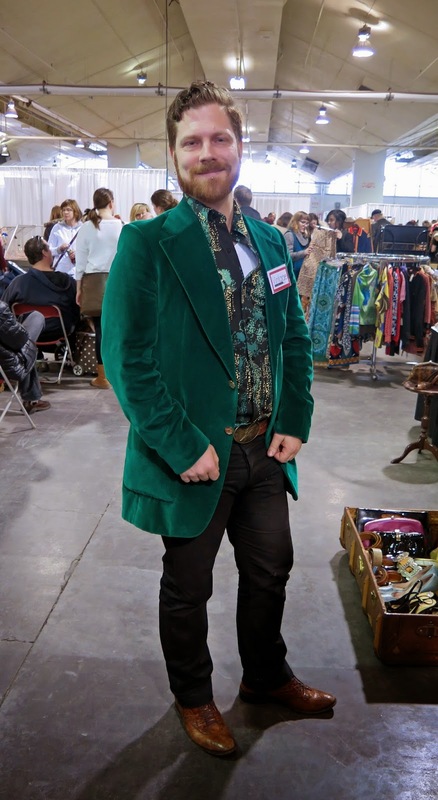 There is always a much larger selection of women's wear then there is for men at vintage clothing shows, but there were still some good finds to be had for the guys. 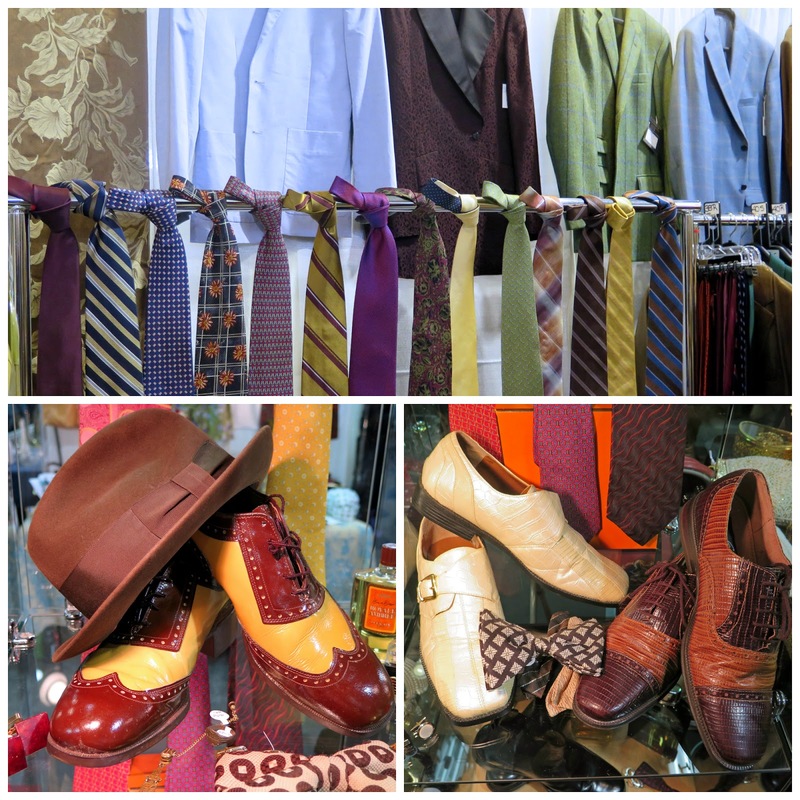 Half of Ian Drummond's booth was devoted to men's clothing and accessories, and Primetime (bottom two photos) had some shoes and other accessories on display that Boardwalk Empire's Nucky Thompson would be happy to add to his wardrobe. I took the opportunity to capture two gorgeous items in one shot. 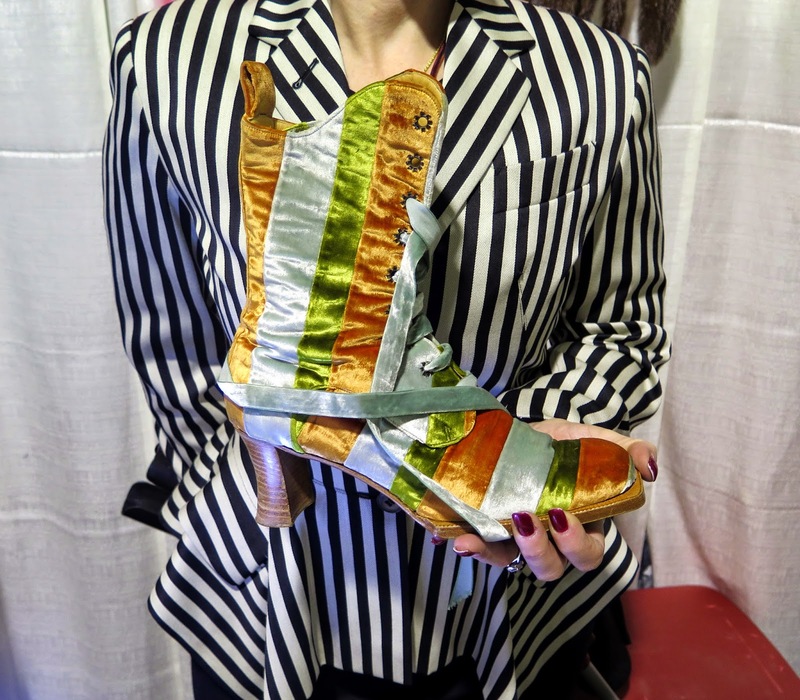 The woman at the Haute Vintage booth holding the velvet Chloe boot is wearing a gorgeous Jean Paul Gaultier jacket with an extremely nipped-in waist and angular peplum (she asked that I not show her face). 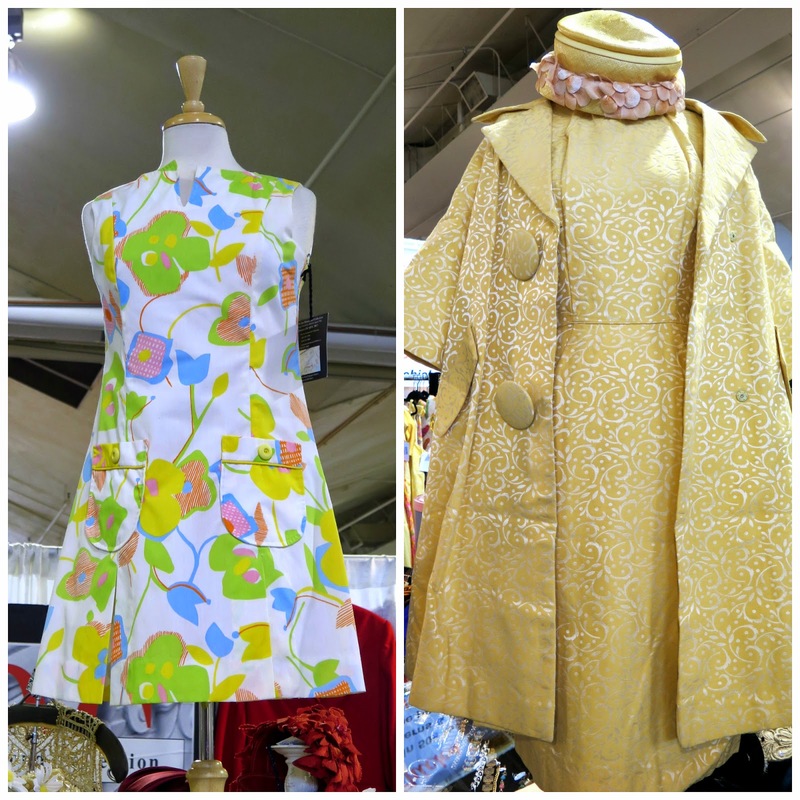 Shows and sales of vintage clothing attracts people who like to dress "outside the box" and have a fondness for the styles of decades gone by, and this event was no exception. Sometimes when I see someone trying on an item of clothing and I think they would be crazy not to buy it, I feel the need to jump in with my opinion. This was one of those times. 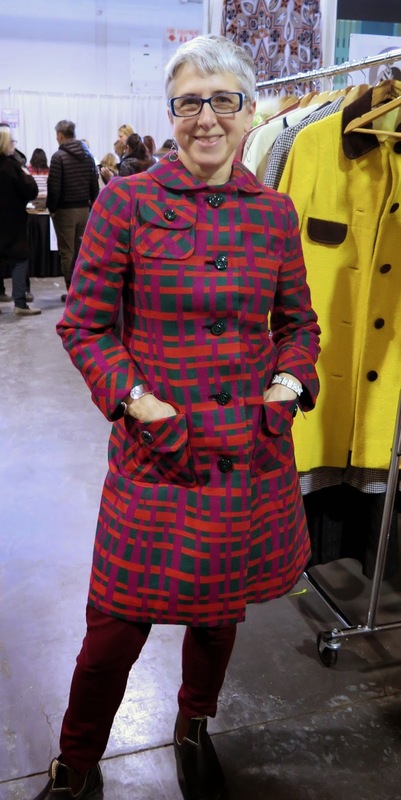 The woman in the photo above was trying on the ultra mod coat at the Factory Girl Vintage booth, and was uncertain about it. It fit her perfectly, in beautiful shape, and was fairly priced - all the boxes checked, so I encouraged her to get it. 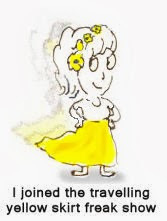 In the end she did and I was thrilled for her. These two friends, and fans of red, were enjoying an outing. 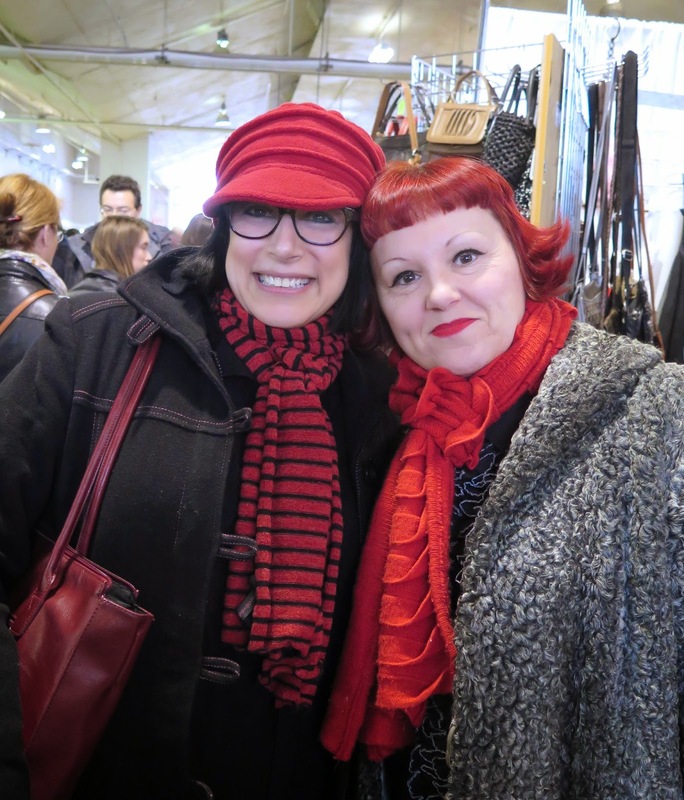 The redhead on the right purchased her Persian Lamb coat at the show. This woman looked just great in her head to toe Rosie the Riveter style. 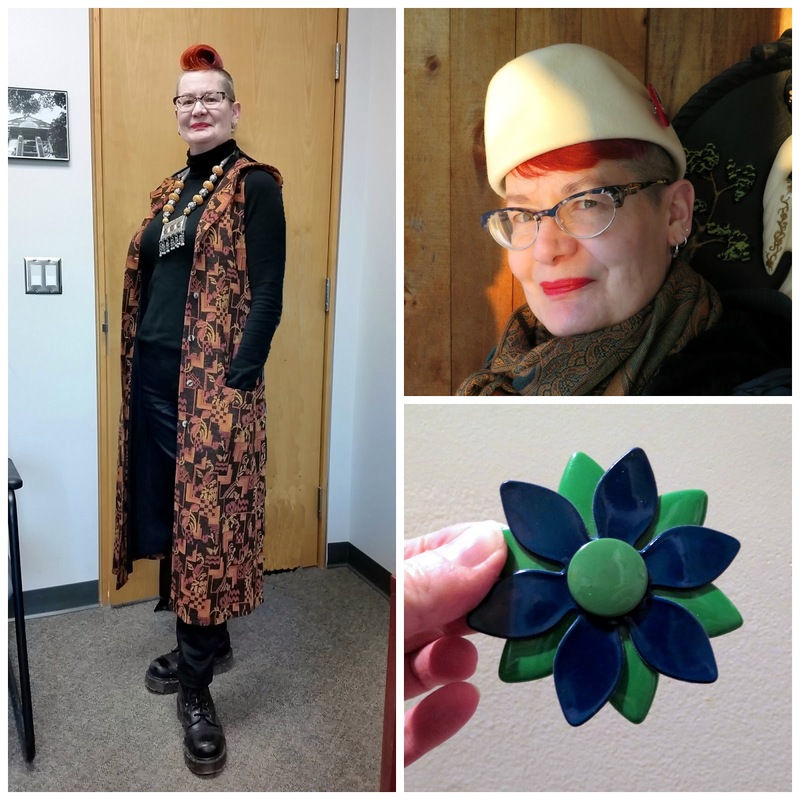 This woman is a member of the Toronto Vintage Society, a community of folks who love all things vintage/retro. 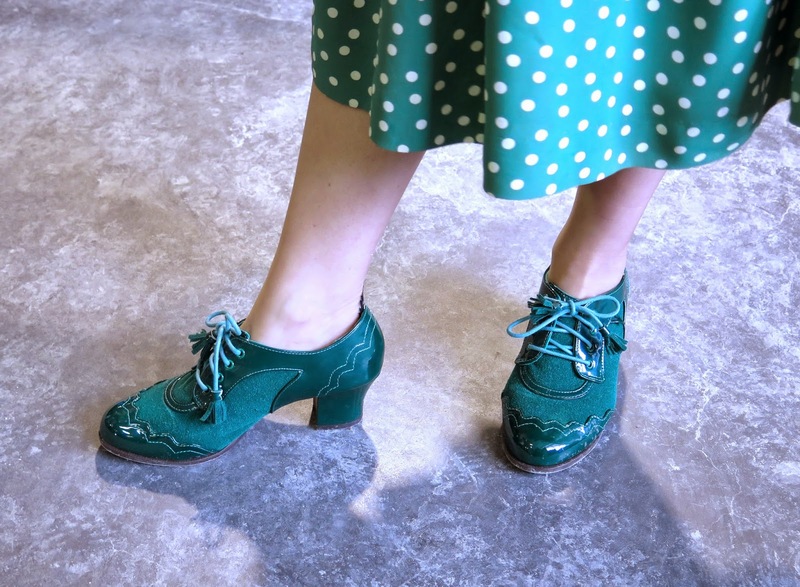 Her shoes are a vintage reproduction, and I should have asked her where she got them, because they are gorgeous!! I stopped this lovely woman for a photograph because of her outfit, and when we exchanged cards, I realized that I had been following her Instagram feed for the last few months. Jessica is also from London, Ontario, and I was surprised that given how small the blogging community is in London we hadn't run into each other before. Her blog is Pin Up Persuasion. I will readily admit that I was completely smitten with this man, originally from England and now living in Toronto. I had been chatting to Sylvie and our friend Krissy when he passed us, and I stopped mid-sentence to say, "excuse me, I have to go follow that man". From the tips of his waxed moustache to the toes of his navy and white shoes, he is completely owning his style. And of course, he was completely charming and had a delightful sense of humour. Sigh. 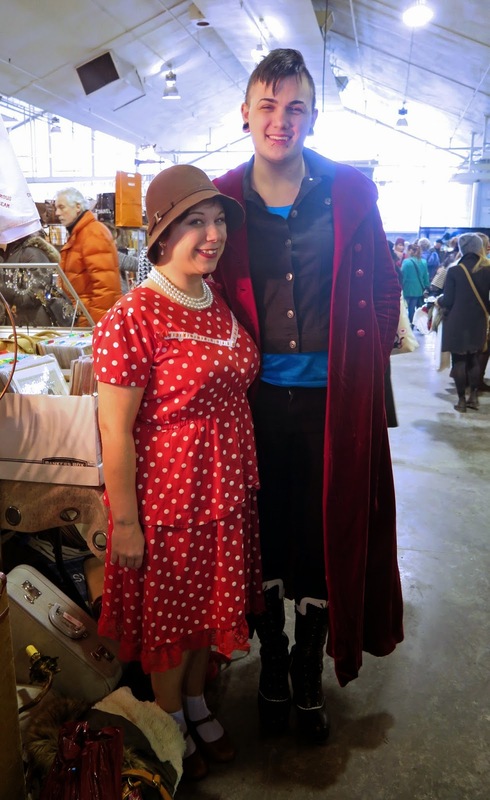 The vendors were no slouch in the style department - the woman on the left was the personification of the name of her booth (just look up the meaning of 'winsome'). I had met her at the Gadsden's Vintage Clothing show last spring and recognized her immediately. The woman on the right was working at the ChanelTouch booth, and we obviously share a love of bold-coloured hair. 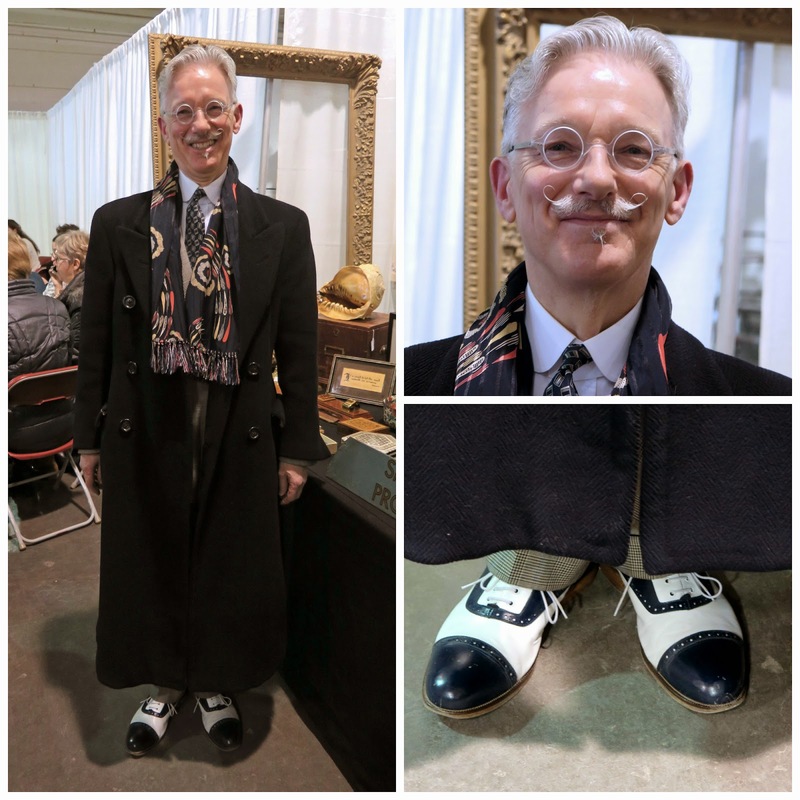 This dapper gent was working at the Evolvintage booth and apparently, he has pants that match his lovely jacket, but thought it might be a little much to wear them both together at the show. Personally I think that would be awesome, especially with his ginger hair and beard. I'm sure you're wondering if I purchased anything, and the answer to that would be yes, but I had set a budget for myself and stuck to it. I came home with the 1970's made-in-Norway wool print vest/dress from KDS Art Wear Home (it even has a hood! ), the cream wool hat from Primetime, and a pair of cheerful 1960's shoe clips (bottom right) from Norma's. I also got another very cool hat from Primetime that I'll show off in a later post. Overall, I thoroughly enjoyed the show. 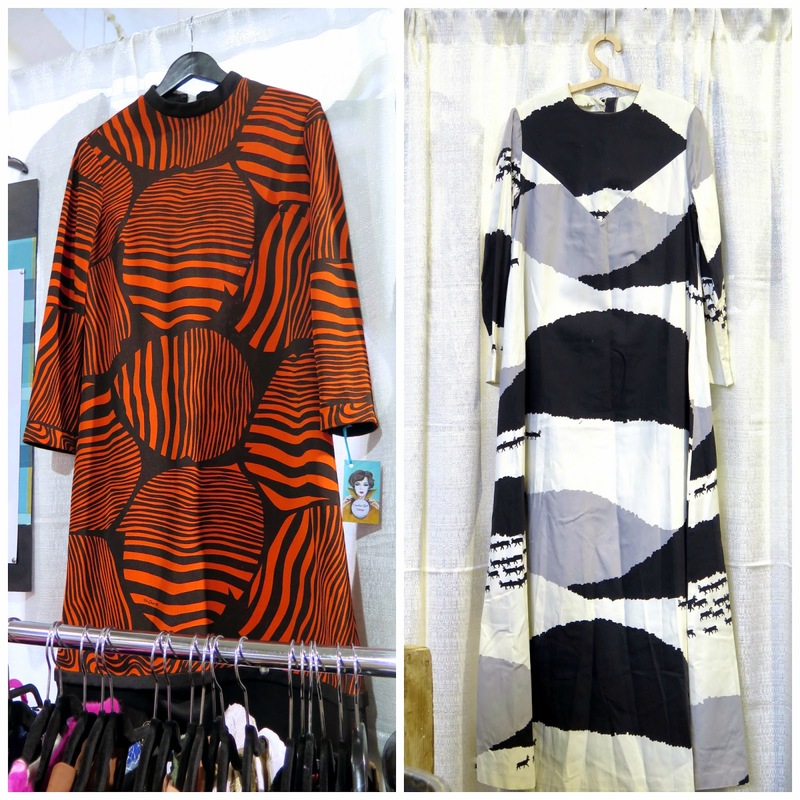 The vendors I spoke with were very friendly and knowledgeable, for the most part, clothing prices were fairly reasonable (at least in comparison to the Manhattan Vintage Clothing Show), and many were willing to give you a better price if you asked nicely (and some gave you a deal without being asked). There was one booth where the centerpiece of their only display was a beautiful hat, which unfortunately had several large moth holes. 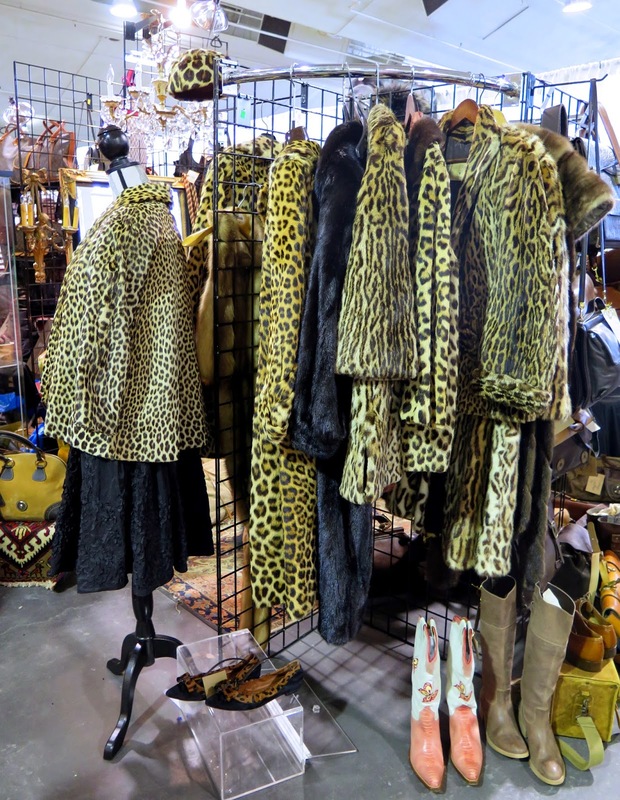 In an event like this, where you are competing for the attention, and dollars of people who in many cases are knowledgeable about vintage clothing, it is imperative that your wares be clean, in excellent condition and attractively displayed. In the meantime, if you are in the Toronto area and need your vintage fix, the Gadsden's Toronto Vintage Clothing Show will be held at Wychwood Barns on Sunday, April 12th. Maybe I'll see you there! 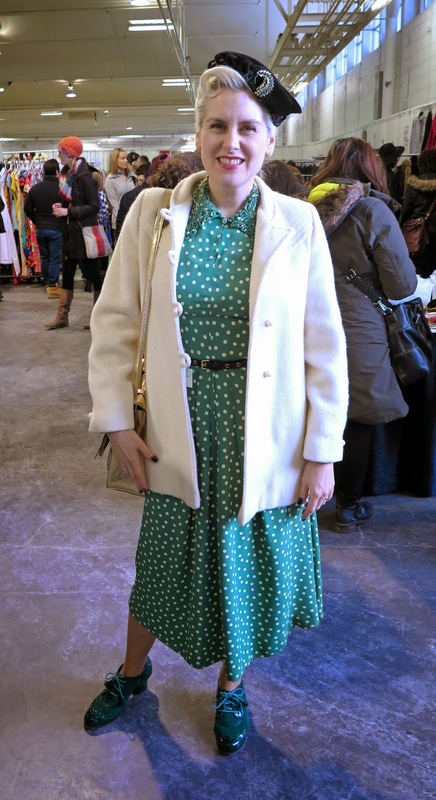 Oh gawd, I do love a big vintage fair - I would have spent hours going through everything. I always set a budget (and only carry cash), always bundle if I'm buying more than one thing in a booth, and always have a great time chatting with the vendors and other people at the shows. Love your cream hat, and that vest makes me want to get my 70s long vintage one out! Great finds, Shelley! Your coverage of this vintage show is fantastic, Shelley. The people, the clothes, the vibe - you've covered it all and make me want to go too. You and Sylvie are well dressed for the occasion and I'm glad you were able to add to your own well-curated personal collection as well. I laughed when you had to "follow that man"! Always on the scent of good style. I *almost* went to this by myself! I might have run into you. I talked myself out of it at the last minute. I've seen that "winsome" gal at some of my dances. She is always picked for best costume or at least at one of the contenders. She is so beautiful it is hard to take your eyes off her. LOVE that groovy vest and necklace you are wearing! PS... you should have asked the man for his number! Green glassware is Fireking Jadeite. 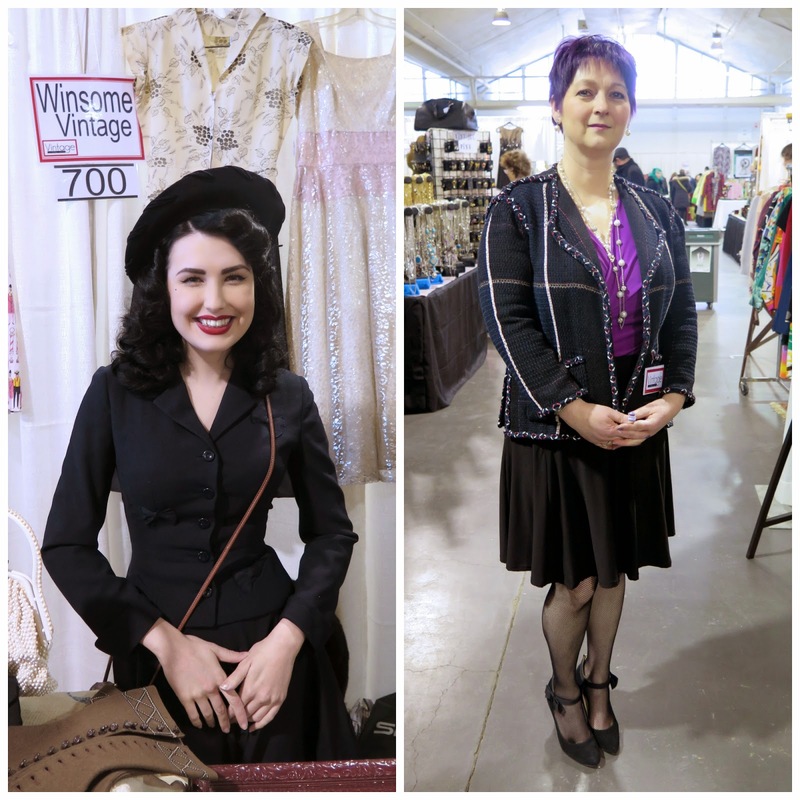 Love your review of the vintage show! So many gorgeous pieces and your commentary is always witty and well written. This looks like an event not to be missed if you're in the area. Your new cream wool hat is a stunner and is a great color for you. Can't wait to see the other hat that you purchased. You added some wonderful new pieces to your closet. 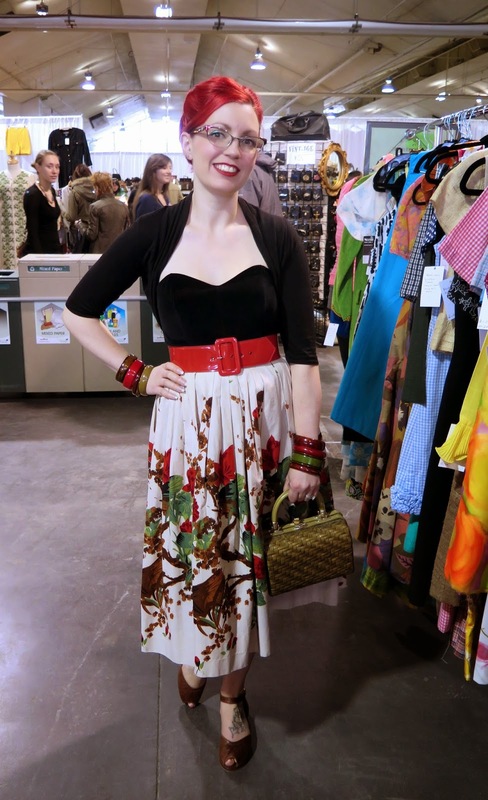 People at vintage shows are always part of the fun, and this venue was no exception. I can see why you were smitten by the well dressed man from England. It's such a small vintage world and so happy to have met you. Thank you for capturing so many great photos that day, I had none of my outfit to share on IG. 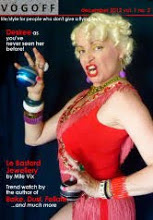 You and Sylvie look suitably gorgeous, and the British bloke is very stylish (wonder whereabouts in the UK he's from? If you see him again, ask him!) Like you, I am taken with the graphic 1960-70s maxis, and those Chloe boots are incredible. I'm so pleased the woman bought that fabulous coat, it's beautiful and suits her wonderfully well. 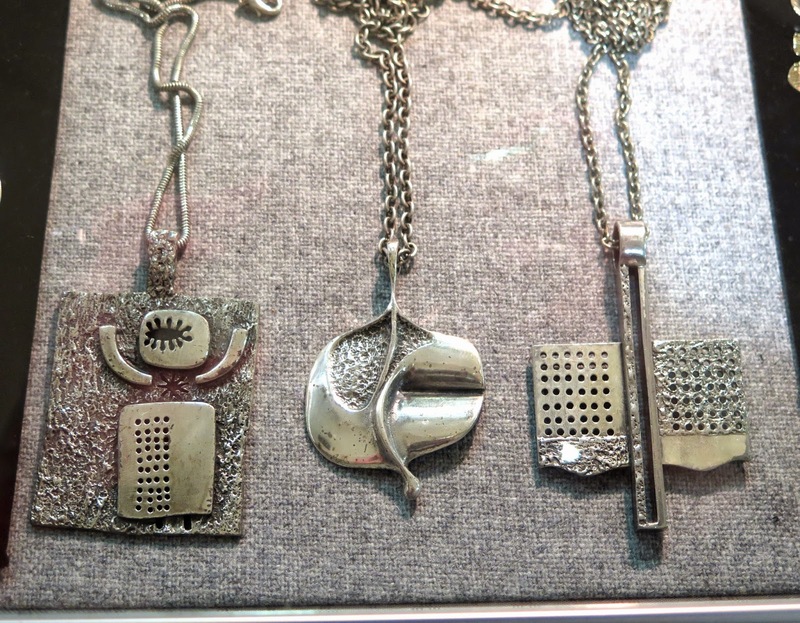 Your purchases are great, I'm sure you will wear the long Norwegian waistcoat a lot, the cream hat is a brilliant shape, and I'm pleased you explained the flower is a shoe clip because I would have assumed it was a brooch! If we had anything even close to this kind of supply, I'd be vintage 24/7! Nothing here but tatty Walmart warmed-overs ... that's the rural south US for you. But fun to see, and you look amazing in both your haori as well as your Norwegian vest-hoodie ... very cool, both pieces. 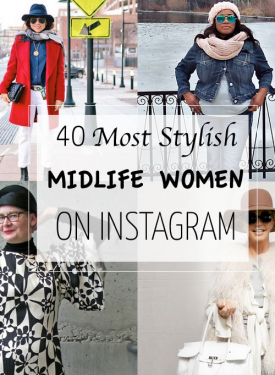 ( You invest cool in just about whatever you wear, girl.) I'd have been following that Richard Gere doppelganger around, too. Ahem. So happy you got to go out and play, and we got a tour! What a great overview. I love this show but was out of town for it this time. Your pictures really sum up how wonderful the show is AND I know a couple of the lovely ladies you posted pictures of.